When you need to keep your handgun, cash and valuables securely hidden yet quickly and easily accessible, this safe (combination or biometric model) is your perfect security guard. The combination model use the reliable and durable electronic three-key pad lets you create your own password to ensure easy and quick access, it is great for home or office. 1. Insert the emergency key. 2. Turn emergency key anticlockwise and open the door. 3. Remove the battery compartment cover and insert 4×AA batteries. When replacing batteries in the future, it is best to use heavy duty alkaline AA batteries. 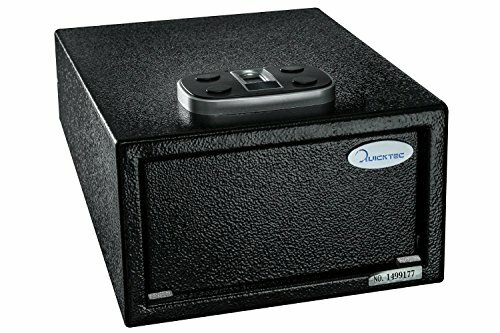 QUICKTEC new biometric pistol safe is not just a secure safe, it's a really fast safe, the high resolution sensor can store up to 32 unique fingerprint IDs. system has the lowest false reject rate and highest acceptance rate to give you quick and accurate access at all times. once more, the green light flash when you heard "trickles", . It means the changes succeed. 2. If not successful, you need to operate again. If you have any questions about this product by Quicktec, contact us by completing and submitting the form below. If you are looking for a specif part number, please include it with your message.